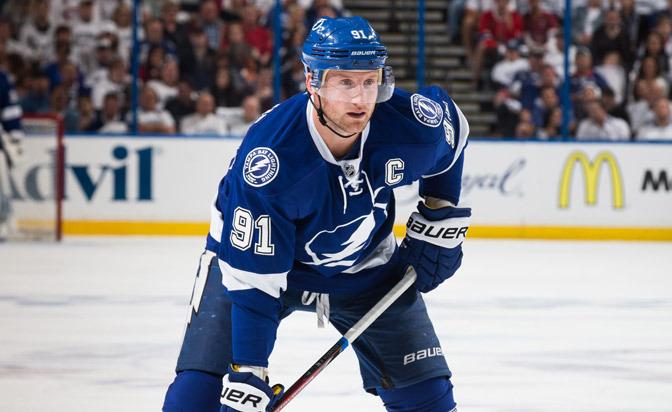 We’ve all heard that rumor by now: Steven Stamkos to the Toronto Maple Leafs. Whether it happens in the offseason or at the trade deadline, that seems to be the hot rumor. The Lightning star has been a hot topic since he lead the team to the Stanley Cup Finals last season and here are three teams he could end up with that aren’t Toronto. Is it just me or does this sound like a Red Wings type move? I wouldn’t be too surprised if Detroit made a play for Stamkos at the deadline. Many people around the NHL believe the Red Wings have the highest chance of landing the Canadian sniper. They certainly have the prospects that would interest former Wing captian and current Lightning GM Steven Yzerman. That isn’t in doubt, but the team’s willingness to deal Stamkos is. If they decide not to deal him at the deadline, the Wings would probably be one of the most aggressive teams in the Stamkos sweepstakes. Okay, I admit that this is way out there but it does make a little sense. If Stamkos doesn’t want to leave Florida and can’t get anything done with Tampa, then the Panthers could be his next team. Think about the kind of team they would have with Stamkos in there. Alexsander Barkov, Jaromir Jagr, Aaron Ekblad, and now Stamkos? That would be an offensive onslaught that would be deadly. The only thing, in my view, that Florida would need then is a goaltender. Roberto Luongo is getting up there in age and I don’t know if he would be a trust worthy option in the playoffs. They could go with a backup instead of grabbing a sure-fire starter. Al Montoya is someone I do not trust in big games. This one is obvious. He could simply re-sign with the Lightning. Tampa would love him back to go with Tyler Johnson and other core pieces already in place. There are things that the Lightning have that other teams don’t. Stamkos is familiar with the coaching staff in Tampa, so he won’t have to get used to anything. Tampa Bay also gives him his best chance at a Stanley Cup, with Detroit and maybe the Washington Capitals having the next best odds at a Cup. The 2016 NHL offseason is sure to be an interesting one. Stamkos headlines a great class of free agents and it remains to be seen how this will all shake out.